Life in this war-torn city intensifies a devotee's yearning for the only permanent shelter. ONE MORE DEADLY NIGHT is falling upon Sarajevo. Although the shooting goes on the whole day, everyone knows that night will bring new hours of terror. Savages from the surrounding hills are most happy destroying and killing under cover of night. I am looking out from the veranda of our temple, which lies on a slope in a densely populated Muslim area. Darkness covers whatever is left of a once beautiful panorama of homes, minarets, Catholic and Orthodox churches, and the domes of synagogues. Heavy projectiles, usually meant for annihilating tanks and fortifications, are now used against people. No one is safe from the fire spewing out from the night. Captives of dark, moist basements offer fervent prayers to the Almighty as death hangs over their heads. "Even God does not want to look upon us," wrote one disappointed journalist. "And for at least the last fifty years no one has wanted to sincerely look upon Him." The war may be a reaction to the cow slaughter and atheistic propaganda that go on here. But are there no other places where these nasty activities go on? Why the reaction here? A proverb from India explains that when one eats too many mangos, blisters pop up here and there on the body. They can pop up anywhere today here, tomorrow there. Which place will be next? In the early-morning freshness typical of Sarajevo, we sneak out of the temple and start with quick steps toward today's destination for delivering Krsna consciousness. Afraid of snipers and stray bombs, we try to choose the least dangerous way. Two young women, Jadranka and Hasija, and a boy, Shevko, carry our paraphernalia: drum, harmonium, and baskets filled with cookies and bread rolls. Our portable puppet theater is strapped to my back. Today we are guests in a home for mentally retarded children. We are led to an underground bomb shelter, where neighbors have also come for safety. We put on a puppet show about Krsna's delivering the cowherd boys from danger. The children and the neighbors like the cookies and rolls we pass out, and they especially like the chanting and dancing. The wonderful potency of the Hare Krsna mantra shows on the faces of the handicapped children jumping and shouting in joy. As we leave the building, we're met with the tumultuous thundering of cannons. The Bhagavad-gita is my best friend now. Not to realize the nature of the material world seems impossible. Srila Prabhupada has explained it so clearly. I look out the window and see that the world really is a temporary, miserable place. Houses stand without roofs, dogs wander without masters, furious and hungry people loiter here and there, a mother cries for her lost son. On this spot on the main street, 150 people were killed or wounded by shells while waiting in a bread line. To commemorate the tragedy, a black book bearing the victims' names sits on a desk, covered with dying flowers. We are here to pass out croissants for free. People are amazed to see anyone passing out free food. Most say something nice about Hare Krsna devotees. One woman approaches with tears in her eyes. "Oh! You are here! Oh! You haven't gone away! Thank you! Thank you very much!" I feel a special pride in being a servant of Krsna. Today we hold a program in the doorway of a skyscraper. A woman devotee named Dubravka, who sings in a pop group, fills the air with the sound of her guitar and the Hare Krsna mantra. Passersby join in, and soon fifty children and adults are loudly chanting Krsna's names. In the chaos of Sarajevo, a moment of harmony is created. After we leave, I think back to that moment, when we felt a separate, higher reality, a world without anxiety. I walk up and down an empty room, chanting on my beads. The room was once full of devotees. They have escaped the jaws of war and found service in temples elsewhere. I long for the association of devotees, so my prayer for Krsna's mercy is stronger than ever. Life without the association of devotees is like life in a cage engulfed in flames. The Hare Krsna mantra is my only solace. Maybe I can now realize what Srila Prabhupada means when he says that our chanting should be like a child's crying for his mother. Last night, rockets exploded close to the temple. A few of us sat in the basement. Our soft chanting mixed with the sighs and depressing conversations of other people who find shelter in our solid house. I looked at the faces of the devotees, who seem calm and steady even in such difficult moments. They always have Krsna, the real shelter. A friend of the temple phones us and tells of her adventures. "The very next day, shells started dropping while I was napping in an armchair. I decided to leave, taking the Srimad-Bhagavatam with me. In the basement, we felt our building being hit. When I returned to my flat, I saw a pile of broken glass on the floor and a bullet hole in the armchair. In a short time, Krsna saved me twice." The morning has broken over this unhappy city of Sarajevo. Through the windows I watch twin skyscrapers slowly burning down. The stench of smoke permeates the valley. The skyscrapers were named Moma, a Serbian name, and Uzeir, a Muslim one. They were meant to symbolize unity. But the people have no basis for unity. In a society without God consciousness, there can be no peace. 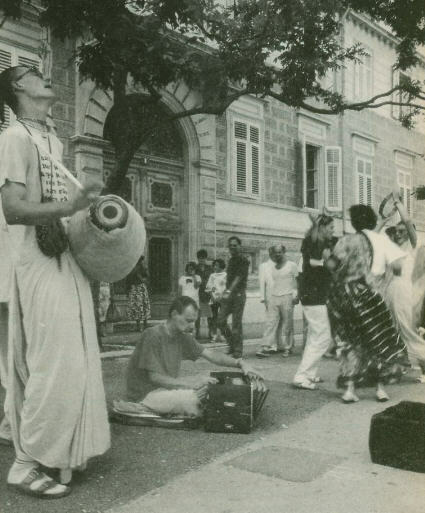 Purujit Dasa, a disciple of ISKCON leader Harikesa Swami, now lives in Croatia.